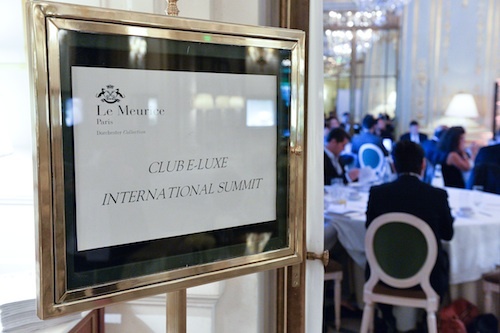 The Club e-Luxe conference in Paris was held at the historic Meurice Hotel. During the Second World War, the German headquarters were housed in the Meurice Hotel. It is in this hotel that General von Choltitz delayed Hitler’s order to destroy Paris. The Germans had wired the Eiffel Tower and other landmarks with explosives to deter the Allied Forces. General von Choltitz privately felt that Hitler was insane, and opted instead to surrender shortly after the Allies entered the city. Thanks to von Choltitz, Paris lives on in all its splendor intact for all of us and future generations to enjoy. Decades later, Ron and I are sitting in one of the loveliest meeting rooms at the Meurice Hotel, Salon Pompadour (note her portrait on the wall), among the top representatives of the world’s premier luxury brands discussing the importance of the latest innovations and strategies in digital media. This week we will be covering the highlights of this event as it applies to luxury real estate marketing and personal and company branding. We were inspired, delighted, and honored to meet our counterparts in the industry.